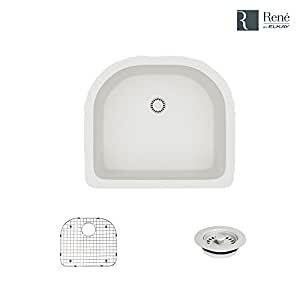 An ivory-colored, D-shape, composite sink designed to be mounted under the countertop. The R3-1005-Ivory is constructed from a unique blend of ground quartzite (80%), acrylic (20%) and silver ions. Overall, this spacious sink measures 24 3/4″ x 22″ x 8 1/4″ and is inherently quiet, stain-resistant, scratch-resistant, and even heat-resistant to temperatures up to 550 degrees. It is guaranteed by a limited lifetime warranty, with template and mounting hardware included. To protect the sink surface from scratches or dents, one superior-quality, custom-fitted, stainless steel grid is included. Its removable rubber feet raise it slightly above the bottom of the sink. Included is one flange in a matching ivory finish. It fits directly over a garbage disposal, and provides the finishing touch to the sink’s appearance.